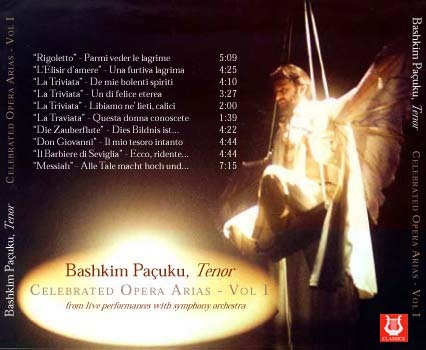 EDITOR'S NOTE: All of the recordings featured in this album are taken from the live performances of tenor Bashkim Paçuku. A vast number of the original recordings were destroyed by those in the Balkans who wanted to silence this great voice forever, so attempting to erase his impact on the singing art achievements. It has been a long and hard struggle to recover them again. 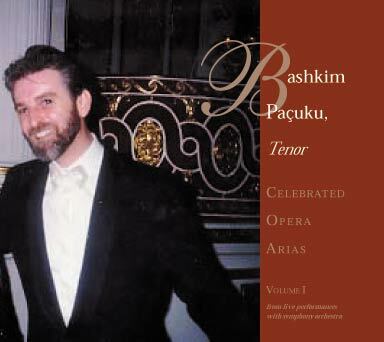 Nevertheless, thank God for some friendly journalists attending his various performances who, using simple recording equipment, rescued these great pieces written by the world's most celebrated composers where Bashkim's voice is shining indeed. This original CD of all live performances is $19.95. Shipping in the United States is FREE. If you are interested in bulk purchases of this CD for resale please contact Bashkim directly.